In this shaky economic environment, we think it's time you take a look at your spending habits. Specifically, we think they could be flashier. Not run-out-and-buy-that-yacht flashy. But low-key flashy. You know...Midwestern flashy. To that end, may we introduce the Chicago Map Money Clip, a handsome way for you to keep your cash, business cards and/or any other assorted flat objects you carry in your pockets in order (those sandwich punch cards get so disorganized). 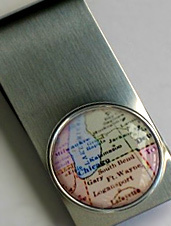 Think of this as Google Maps for your money...if Google Maps were merely a single static embossed vintage map of the area around Lake Michigan on the side of a polished, stainless steel money clip. But mostly it's a way you can finally show off that huge wad of green in a way that says, "Hey, I know where I come from." Literally. If you'd rather leave the maps in the glove compartment, these clips are fully customizable, meaning you can work with the designer to have your favorite jpegs or other graphic images put on the side. Your face really does belong on money.